I meet with a wonderful group of ladies from my church 2 Wednesday afternoons a month and we sew. We make quilts to be donated to various groups that need them. One of the places we take the quilts is our local VA hospital. So we make them in patriotic colors and masculine prints. Besides bed quilts, we make lap quilts for wheelchair patients. I've made 3 lap quilts so far this year, and did not photograph any of them! Oh well. This quilt is a simple one, as most of our donated ones are. It's not that I wouldn't make fancier quilts for donation, but we are going for quantity so we have to get them done rather quickly. Our group leader calls them utility quilts so they are made of leftovers, recycles, everything that we can match up and turn into something usable. The people who receive them are very appreciative and that is all that counts. I grabbed a huge chunk of this cute pink bicycle fabric at a Quilts for Kids meeting a while ago. I decided to use it as a feature fabric and framed it with some pink solid. It was a simple design that used up large blocks of the fabric. After the top was done, I still had enough left to use as the backing for the quilt. I added a pink strip to the back to add interest. I quilted the layers together with straight line machine quilting and added the label. It's ready to be turned in at next Quilt for Kids meeting. I mentioned in an earlier post that I would be making more of these little treat bags. I have plenty of foodie fabric on hand for quite some time so it was fun to finally use it up. The download for the pattern and instructions can be found here. A few months ago I took a stack of charm squares from the Quilts for Kids fabric stash. It was really cute children's fabric however there is a limited number of the squares making it a difficult to figure out how to use them. While looking through one of my charm square books, I found a pattern that works perfectly. And I had just enough charms to make it work. 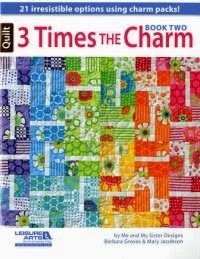 The book is called 3 Times the Charm Book Two and it has lots of great ideas for using charm squares. All I needed to get was some fabric in solid colors to accent the charm squares and for the backing. It was a quick and easy project that I finished in two days. After adding a label, it's ready for donation to Quilts for Kids. I finished the binding on the Ron Swanson quilt today. It was a sunny 84 degrees this afternoon; a perfect time to sit outside and hand stitch. Although I do admit that having the quilt on my lap was making me a little warm. I used a polyester-cotton blend for the batting on this one which made it considerably lighter than one made with Warm 'N Natural batting so I really should not complain. I know a lot of people don't care for the poly-blend battings, but I find that when I am working on something that is not very practical, the poly-blend works just fine. In fact, I like the loftier yet lighter feel of it when working on something like this that will probably spend more time hanging on a wall than on a lap. But we shall see, it might be just as nice on a lap too! I was inspired by a comment my nephew, Jason made regarding the quilt when I posted the WIP on Facebook. 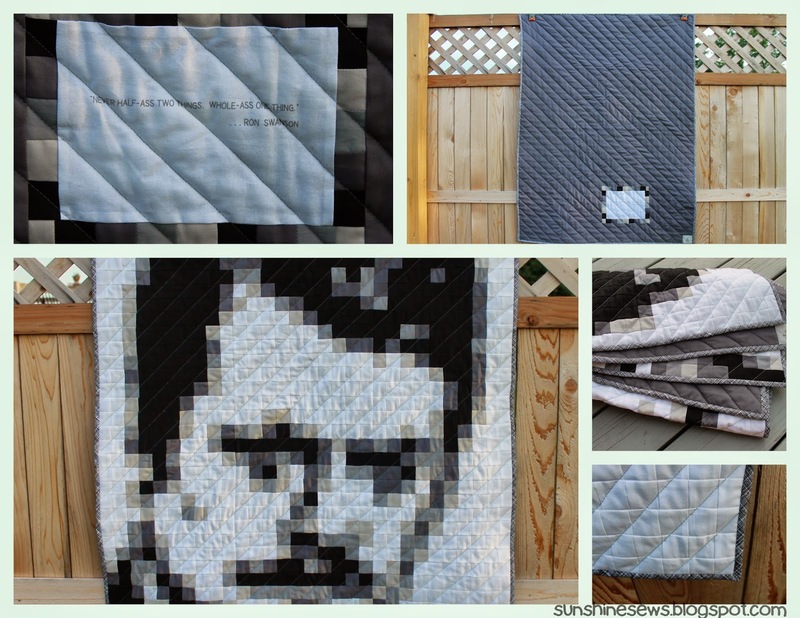 He used a Ron Swanson quote to compliment my work so I turned that into a block on the back of the quilt. Thank you, Jason.